(Scott Sommerdorf | The Salt Lake Tribune) Nineteen-year-old Kayden Troff collects a chess set from each new country he visits while playing tournament. This one is from Finland. Troff will be competing in the U.S. Junior Championship in St.Louis Ð a tournament he won in 2014. He heads off on his two-year religious mission to Australia in October. Logan • A school secretary in the tiny Kansas town of Lost Springs, population 70, was surprised to see an old man stop by unannounced one day. He introduced himself as Warren Pugh and asked if they had any chess sets. “He just happened to be driving by, and he saw that there was a school, so he dropped in to talk to us,” Terri Bina said. Bina, who works at the pre-K-12 Centre School, said Pugh provided her with articles and statistics on the benefits of chess. He was out of chess sets by the time he made it to Lost Springs, but about a month later, Bina said, some vinyl boards showed up in the mail. “I thought it was just cool,” she said. Bina is one of approximately 2,000 school secretaries across 24 states that Pugh has visited in his crusade to bring chess to schoolchildren. Sitting at the dining room table in his Logan home, Pugh, 85, tapped on a yellow legal pad. His wife looks down streets on the right, and he takes the streets on the left. “As soon as we see one of those things we make a U-turn or a left turn or a right turn and we head down the road . it’s done very, very, very randomly,” he said. Pugh is a retired math teacher who lived in Washington, California and Florida before moving to Cache Valley over a year ago. He said he began giving away chess sets to schools while he was still teaching but took it to another level after his retirement in 2000. He bought a used car in 2014 that had 26,000 miles on it. It now has 167,000 miles on the odometer. “That’s a lot of traveling,” Pugh said. After his wife, Joyce, passed away in 2013 in Redding, California, he said he would make regular trips back and forth to Hyrum, where he has close friends. He would stop off in Susanville, Reno, Sparks, Lovelock, Winnemucca, Elko, Wells, Battle Mountain and West Wendover. He’s also taken trips up the West Coast to Oregon and Washington. Pugh said he remarried a woman named — Marilynne — in 2015, and just last year made they a cross-country trip from Utah to Florida, then up the East Coast, into Ohio then back across the plains to Utah. He said the vast majority of school secretaries and principals are interested when he offers free chess sets. Others say elementary kids are too young to play chess. One school, Pugh said, reported back that they were having trouble finding room to display their chess trophies. Bina said her school unfortunately hasn’t used the chess sets yet, but Pugh has certainly had an impact on the town of Winnemucca, Nevada. Ray Parks, principal at Lowry High School in Winnemucca, a town of about 8,000, said Pugh has been making the rounds at local elementary schools for years. Parks said he told Pugh about a freshman academic success class for at-risk students. Some had failed several classes in eighth grade and were struggling in their first year of high school. Pugh began speaking with math teacher Bryan Mahoney, who was trying to figure out how to deal with the rambunctious group of freshman. Pugh, of course, offered chess sets. Parks said the two of them hit it off. He said Mahoney began using chess as a reward system that morphed into a lunchtime activity. Then they started hosting tournaments, which the local newspaper covered. “For our real at-risk kids who haven’t been successful with anything, all of a sudden they jumped into something that they thought was for the smart, elite kid, the rich kid,” Parks said. Chess provided something different for the students, Parks said. Instead of failing several classes, the students in the academic success class had passing grades and were starting to win chess tournaments. In the age of internet and email, Parks said seeing Pugh actually show up to a school was like a breath of fresh air. “He had, I think, a profound effect on our kids,” Parks said. And he’s not done. 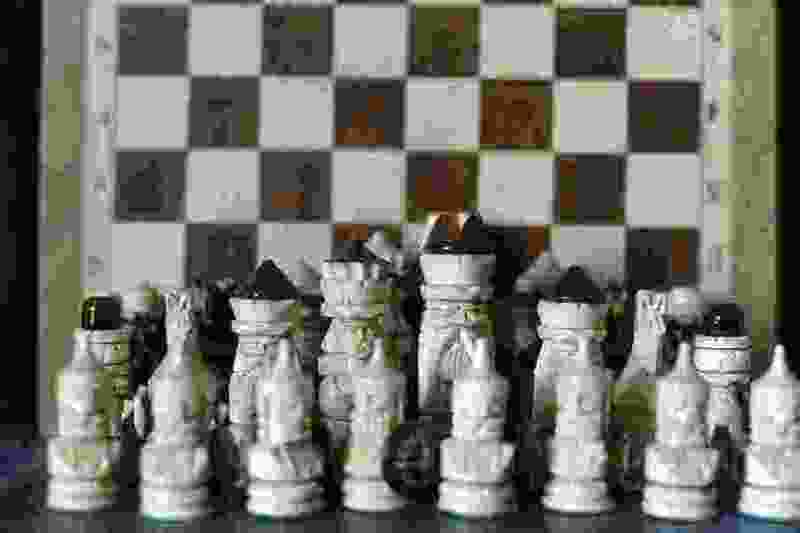 Since Mahoney recently retired, Pugh is planning on returning to Winnemucca to train up a new batch of teachers to continue the chess program at Lowry High School. Three cardboard boxes containing 120 vinyl chess boards and plastic pieces currently wait in a back room in Pugh’s home, waiting to change young lives. Pugh said he will repackage the pieces in Ziploc bags over the next month or two before hitting the road again in April. Pugh said he can’t really describe why he does what he does. Every morning of his 30 years as a math teacher, he said, kids would come to his room and play chess. He saw how it can transform students. The game teaches critical thinking skills, reasoning, sportsmanship and creativity. At 85 years old, Pugh plans to keep on keeping on. One mile at a time, one chess set at a time, he is determined to share the beauty of chess.